손은정,(2006).대상화 경험이 여성의 정신 건강에 미치는 영향.한국심리학회지: 여성,11(4),399-417. 여성들에게 특히 유병률이 높은 정신 장애에 대해 그동안 여러 관점에서 그 원인을 설명하고자 했으나 부분적인 설명만을 제공할 뿐이었다. 본 고에서는 대상화 이론을 살펴봄으로써 정신 건강 문제들에서 나타나는 성차에 대해 새로운 대안적인 관점을 제안하고자 했다. 이를 위해 대상화 이론에 대한 내용을 소개한 후 대상화 이론과 관련된 선행 연구들을 살펴봄으로써 이 이론의 실증적인 가치에 대해 점검하였다. 대상화 이론에서는 여성의 신체는 남성의 신체보다 타인에 의해 관찰되어지는 성적 대상화를 더 많이 경험하게 된다고 보았고, 여성들은 반복되는 성적 대상화 경험을 통해 관찰자의 관점을 자신의 주요 관점으로 내면화함으로써 자기 대상화를 발달시키게 된다고 설명하고 있다. 자기 대상화에 의해 여러 가지 부정적인 심리적 경험들을 하게 되며, 이러한 부정적인 경험이 축적되어 섭식 장애, 우울증, 성기능 장애와 같은 정신 장애에 영향을 미치게 된다고 보았다. 대상화 이론과 관련해서 그동안 이루어진 경험적 연구들에서는 (a) 성적 대상화는 자기 대상화를 초래하며, (b) 대상화 경험에 있어서 남녀 성차가 있고, (c) 대상화 경험은 연령의 변화에 따라 달라지며, (d) 대상화 경험은 섭식 장애, 부정적인 정서들, 수행 능력, 부적응적인 행동들에 영향을 미치는 것으로 나타났으며, 이러한 연구결과들은 대상화 이론이 실증적으로 입증될 수 있는 것임을 보여주고 있다. 대상화 이론은 자기 대상화라는 개인차를 보이는 심리적 변인을 제안하였다는 것에서 그 의의를 찾아볼 수 있다. 추후 연구에서는 자기 대상화에 대한 개념에 대해 더 명확히 밝힐 필요가 있으며, 대상화 이론을 적용한 연구의 영역을 보다 확대해야 할 것이다. There were some theories explaining the reason of gender differences in a few mental disorders whose women`s prevalence ratio is higher than men`s. However, the previous theories have provided just partial explanations for gender differences. In this study, the alternative explanation for women`s mental health would be presented by exploring objectification theory. Women`s body is more objectified by others than men. It is called sexual objectification. The repetition of sexual objectification may cause self-objectification by internalizing the observer`s point for their body. Self-objectification is likely to bring about some negative experiences: shame, anxiety, the lack of peak motivational state, the deficiency for an awareness of internal bodily states. The accumulation of negative experiences lead to mental health risks: eating disorders, depression, sexual dysfunctions. The objectification theory has been proved by empirical studies by this time. 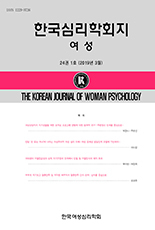 The results of these studies showed that (a) sexual objectification causes self objectification, (b) the experiences of objectification are different between women and men, (c) the experiences of objectification changes according to developmental stages (d) objectification had an effect on eating disorders, negative emotions, performance ability, and non-adaptive behaviors. The implication of objectification theory is the proposal of the individual psychological concept ``self objectification``. The concept of ``self objectification`` might be clarified, and the range of research based on the objectification theory should be broaden in the future research.